Sometimes things have to get noticed before they get appreciated. For example, White Cap: her buds are modest and fragile, but her flowers stand out. The contrast between her dark purple petals and bowl-shaped white heart is just amazing. While White Cap is still in the bud, she is not a special flower. 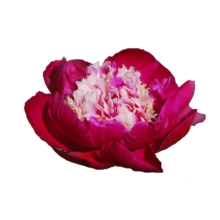 In the bud, this peony is fragile, her purple colour hardly stands out and she is not fragrant. What makes her so unique? Well, when she opens up, a pretty contrast between her dark purple petals and white, bowl-shaped heart unfolds. That is why she is called White Cap and that is also the reason why we like her so much. White Cap has been on the market for quite a while but has never gained popularity. We think it has something to do with the appearance of her buds. Too bad, because we really enjoy her when she is in bloom. White Cap was bred by Winchell. She got registered at the American Peony Society in 1956.